You can purchase Heavy Dreamers here. Vanishing Kids will be on the bill for the CD Release event with Last Crack at the High Noon on May 31st in what is sure to be one of the rock music highlights of the year. Vanishing Kids were formed in Madison in 2000 by core members Nikki Drohomyreky (vocals/keyboards) and Jason Hartman (guitars). Their music has been rooted in metal, progressive rock, and punk but has evolved over time, accentuating goth and doom and psychedelic influences to create a symbiosis of styles that has become uniquely their own. After three albums, the band left Madison, relocating to Portland, Oregon, a period of time that saw them produce their fourth, Spirit Visions, in 2013. After undergoing personnel as well as life changes, Drohomyreky and Hartman returned to Wisconsin, becoming parents. Staying true to their musical mission, they succeeded in establishing a lineup, which has been solid for nearly six years now, grounding their lives and providing focus. The addition of bassist Jerry Sofran (Lethal Heathen, Mirrored Image), a childhood idol of Hartman, began a new chapter and drummer Hart Allan Miller (Wartorn, Deathwish, Tenement) joined soon after. 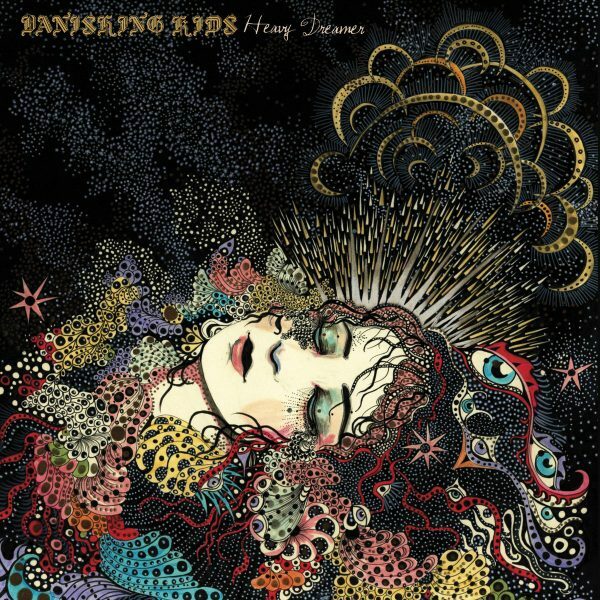 Heavy Dreamers is Vanishing Kids’ fifth album and has been getting rave reviews. 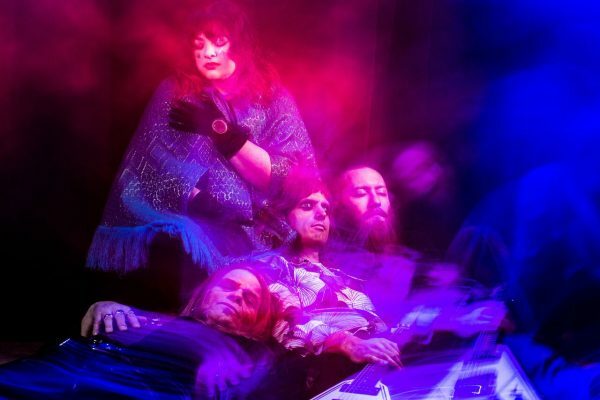 The band has a global reach and are currently with Svart Records, which is based in Finland. Heavy Dreamers could be described as Mazzy Star’s mushroom nightmares set to the concrete wall-of-sound of Jucifer. Heavy industrial noise lurks in the bedrock. Drohomyreky’s voice floats angelically, providing melody like a torch through the darkest haunted forest. Hartman’s spellbinding guitar solos taunt the faint of heart. The crushing rhythm section pushes the low end to the very brink of distortion. The keyboards are thick, swampy washes of sound sometimes coming to the fore, other times the guitars lead the way. And yet, it’s not all like this. Amidst the crush there is light as the cacophony gives way to passages of intense beauty. Heavy Dreamers then is a beast – a living, heaving and breathing organism. Vanishing Kids succeed in switching all these elements up to great effect and the album’s eight songs get more interesting as the album progresses. That would saying a lot because “Creation” is a monster coming out of the gate. A slow burner, it builds from the sound of water and works through two verse-chorus sections before relaxing, then rebuilds to a crashing crescendo. Its cinematic scope lends itself to video production, which is exactly what they’ve done. “Heavy Dreamer” follows, borrowing the opening passage from Deep Purple’s “Child in Time” but that would be where the comparison ends. The whole album juxtaposes sonic darkness with resolute but uplifting lyrics: “My heavy dreamer / I hope you dream tonight / You better catch them / Before we say goodbye / I know I sold you / On a dream or two / My heavy dreamer / I hope these dreams come true.” Here is a video of “Heavy Dreamer” shot recently at the High Noon Saloon. If there’s a theme in the album’s lyrics it could be summed up from this short phrase from “The Reaper,” one of the album’s more astonishing tracks: “The night will cover all your worries / Hang on tight, but let go, too.” Dreams being the commonality running through all these songs, as in hang on to them, no matter the uncertainty. Hartman really shines on this one, ripping off an extended solo. Heavy Dreamers’ last two songs stray slightly from the rest. “Rainbows” is dominated by keyboards, shifting time motifs and a variety of guitar colorings. The distortion is dialed back a bit which gives the vocal more room to breathe. The drum pattern is distinct as well. “Magnetic Magenta Blue” is also dominated by keyboards while the guitar again is cleaner, Hartman even employing a bit of wah-wah. The vocals throughout Heavy Dreamers are heavily washed in reverbs and long delays as are backing vocals – all sung by Drohomyreky. A lyric sheet, which only comes with the vinyl version, is necessary for digging into the prose as the singing is frequently low in the mix. As such, the vocals become part of the instruments which somewhat defies the conditioning that dictates vocals should ride the top. Sometimes, however the songs are yearning for vocal clarity. Drohomyreky is certainly a capable singer and the lyrics are good. Heavy Dreamers is a satisfying recording and a welcome return for Vanishing Kids. They’ve stuck it out for nearly twenty years now, far more than the norm. These are the type of acts that mandate support. Though the music is out there to stream, even in its entirety on YouTube, fans of local music should cough up some dough and buy it. Vanishing Kids are worth it.